There was a time when you’d have to stop at multiple retailers to get your tools, your paint and your landscaping needs. Not anymore. Are you thinking it has to be a big-box store, where local, quality customer service holds little value? Think again. The family-owned-and-operated Baskin’s Ace Hardware is so much more than just your local hardware store. Founded in 1977 by Bill and Marilyn Baskin, it has grown over the years from one little hardware store in Orleans to four convenient locations around the Cape – Orleans, South Dennis, Harwich Port and South Yarmouth. “They pretty much started out by themselves,” said daughter Lauren Baskin, of Bill and Marilyn. “As they started to expand, Jim Morton became the manager of the Orleans store. He’s been with us over 35 years now.” Lauren Baskin now oversees the operations of all four of the Baskin’s locations. 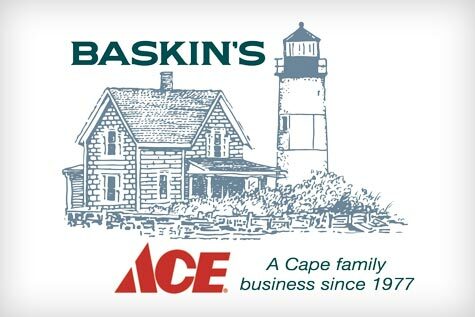 For the last 40 years, the Baskin family and their employees have strived to bring the Cape Cod communities the very best in both products and service. 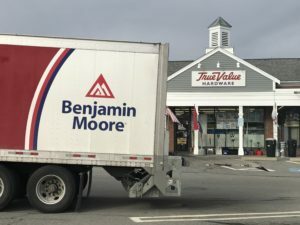 Just recently, the company announced the addition of the Benjamin Moore line of paints and products to the Harwich Port store shelves, and they are thrilled by the response from their customers. 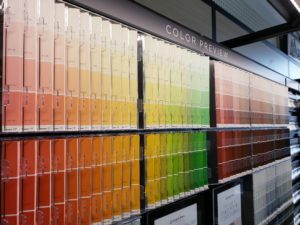 Terrio said Benjamin Moore offers a good, better and best price point in their paint lines so, even though it might cost a little more in general, you truly get what you’re paying for. “Most people understand that you’re paying for a product that will last, and definitely last longer than some cheaper brand,” he added. And the product line does not only include interior/exterior paints, but items like concrete floor paints and stains, and primers that will seal concrete. They manufacture pool paint, field marking paint, and chalkboard paint, which is not only great for families with small children, but for businesses like restaurants. Baskin’s also carries all your needs in automotive supplies, electrical and lighting, cleaning, heating and cooling, lawn and garden, and so much more. Some of their convenient services include carpet cleaner rental, blade sharpening, computer paint matching, key cutting, shade cutting and more. They even have a UPS drop box location in their Harwich, South Dennis and South Yarmouth locations. Baskin’s actively supports several environmental initiatives through the local conservation trusts in different communities. They also hold a fundraiser each year for the Harwich Fire Department. They have a cookout and sell hot dogs, and ask for donations, which go to support local firefighters. Baskin’s gets involved when the community needs support. Recently they donated blue light bulbs to raise funds in honor of Sean Gannon and in the past they have conducted fund raisers for individuals in the community who needed help. They pride themselves on being an active member of the communities of each of their stores. Baskin’s Ace Hardware is truly the epitome of a family-owned and operated local business. Check out for yourself all they have to offer at baskinstruevalue.com.